Alemuel and Amanuel Sims were twins, born in December 1840 in Ohio. Their parents were Abram and Susan Sims. Abram was born in Pennsylvania and Susan in Ohio. The twins had an older brother, a pair of younger sibling twins (a boy and a girl), and a younger brother. The family moved about, westward. The 1850 census showed the Sims family in Kalamazoo County, Michigan. They were in Kansas territory in the 1860s. Abram died there in 1860. Some of the family lingered for a while in Kansas. The 1860 census shows Susan, Amanuel, the younger set of twins, and the youngest child, William, living in Neosho Township in Morris County, Kansas, but Lemuel is gone—moved on to Illinois. With the Fifty-First Illinois Infantry. 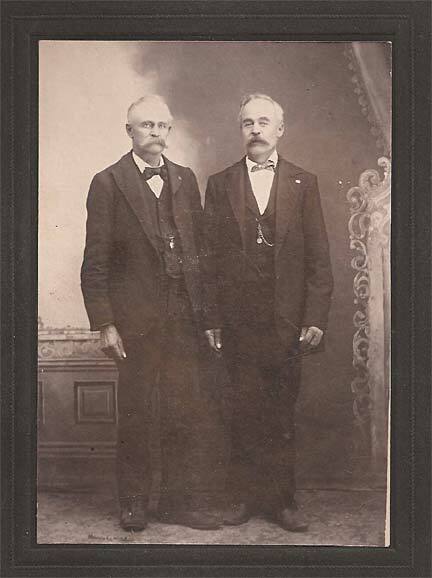 By the Spring of 1862, Alemuel and Amanuel were both in Iroquois County, Illinois where Nathaniel Petts had recruited a company of men, which moved to Chicago for training in late 1861 and became Company C of the Fifty-First Illinois. The twins did not enroll during the initial recruiting effort, but after the regiment was formed, after it trained and outfitted at Camp Douglas, Chicago, and after it had moved to the field of war, the twins signed up on March 3, 1862—thus becoming members of an Iroquois County unit. They caught up with the regiment and were formally mustered in at Bertrand, Missouri on March 9. They were therefore classed as "recruits," having joined the regiment after it was initially constituted. They served with the regiment through its first campaigns at New Madrid/Island No. 10, the abortive river campaign to Fort Pillow (1862 Tab), the engagements at Farmington, Mississippi, the Siege of Corinth, and then the regiment's railroad guard duties in August and September 1862. During the weeks of railroad-guard duty the regiment was broken up in one- and two-company sized detachments and scattered along the Memphis & Charles Railroad across northern Alabama. In the regimental journal for 1862 regimental journal for 1862, Lieutentant Colonel Bradley recorded the assignments, "Left companies H & K of the [51st] under Capt Rose at Mallard Creek to guard tressle work, Companies E & G under Maj. Raymond at Fox Creek to guard bridges, Company C Lieut Tilton at Trinity, balance of the Regt at Decatur." The scattering of the units made them vulnerable in Confederate territory. A detachment of Companies H and K came under attack by Philip Roddy's cavalry on August 6. The regimental surgeon was captured while traveling from Mallard Creek to Decatur, from one regimental contingent to another. A scouting mission under Corporal Benjamin James of Company C went awry. James' little troop was surrounded by Confederates and on August 22 eight men were captured, among them Amanuel. He was sent to Richmond, Virginia as a prisoner of war. James' captured comrades were paroled on October 17, 1862, so Amanuel's stay in the Confederate capital was relatively short. Though paroled, he was still formally a prisoner of war and waiting for formal exchange to allow his return to the regiment. In early 1863 he was at the Federal parole camp at Benton Barracks, Missouri. He returned to the regiment on April 6, 1863, after an absence of seven months. Alemuel, meanwhile, had been through the Battle of Stone's River at the end of December, 1862 and then been in camp in mid-Tennessee up to the time of Amanuel's return to the regiment. Illness, 1862-1864. Both Alemuel and Amanuel had bouts of illness that took them away from regimental duties in the course of their careers with the Fifty-First. Alemuel was in the regimental hospital in May 1862 suffering from diarrhea. Soon after returning from Confederate prison Amanuel was in the convalescent hospital at Benton Barracks to recover from chronic diarrhea. He was again in the regimental hospital in May 1863 for "indigestion", whatever that might have referred to. Amanuel was also absent sick in June 1864 with "lung fever". He was first in the divisional field hospital and then sent to the Federal hospital at Ackworth, Georgia. Chickamauga and Thereafter. Amanuel became an aide to Captain Albert Tilton of Company C on August 1, 1863. It was a short-lived piece of his military career. On September 19 at the Battle of Chickamauga, as the regiment was engaged on the Federal right at Viniard Farm, Amanuel was shot through the ankle. The ball fractured the bone. 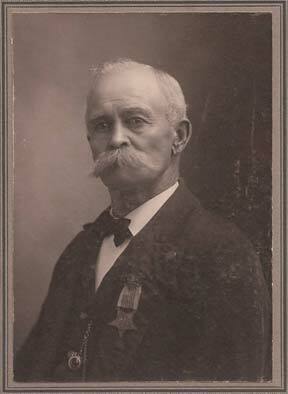 The next day he was captured when the division hospital was overrun by Confederate cavalry. For just over a week, Amanuel was help captive on the field of battle. Then he was paroled with many other Federal soldiers who were too wounded to walk and travel by train to Richmond for processing as prisoners of war. Around October 1st ambulances carried Amanuel and his fellow sufferers through the Union lines to Federal hospitals in Chattanooga. On October 12 Amanuel was transferred to Federal military hospital in Nashville. On October 30, he was admitted to the Federal military hospital in New Albany, Indiana. Amanuel contracted smallpox while in the hospital at New Albany and was transferred across the river to the Federal hospital at Louisville, Kentucky on December 28, 1863. We have no further hospital confinement record for Amanuel after his stay in the smallpox hospital ("Eruptive USA General Hospital") at Louisville. No doubt, like other of his comrades who were wounded, captured, and hospitalized after Chickamauga, Amanuel was furloughed home and spent time there waiting to be fully recovered, officially exchanged, and returned to the regiment. He was back with the regiment, reunited with Alemuel, just as the 1864 Georgia Campaign began in May. The two were present for the final battles of Franklin and Nashville in November and December 1864. Neither Alemuel nor Amanuel reenlisted for a second three-year term with the Fifty-First. Therefore, their terms of service expired in March 1865, and they were mustered out on the 9th at Decatur, Alabama where the regiment was camped at the time. Alemuel's wife was Mary. They raised their family in Minnesota. The 1920 census shows Amanuel living in Alma, Harlan County, Nebraska. His wife is listed as Maria, born in Germany. Alemuel died on November 2, 1918 at Austen, Minnesota. Amanuel died on April 17, 1926. Amanuel Sims, Compiled Service Record, Records of the Adjutant General's Office, 1780's-1917, Record Group 94, National Archives and Records Administration, Washington, D.C.
Alemuel Sims, Compiled Service Record, Records of the Adjutant General's Office, 1780's-1917, Record Group 94, National Archives and Records Administration, Washington, D.C.
Photographs and family information made available through the courtesy of Mary Jean Hall, descended in the line of the twins' younger brother William Perry Sims and his wife Sarah Porter Sims. 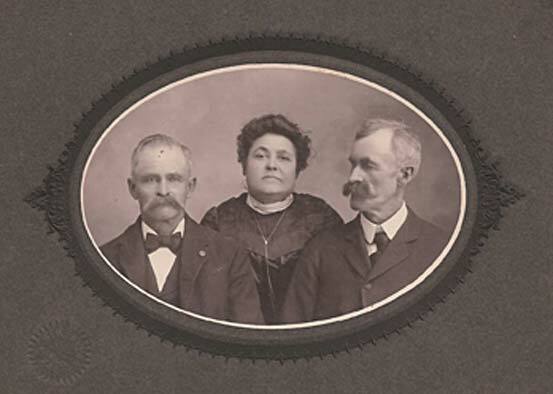 The picture at right shows Alemuel "Lem" Sims on the left, younger brother William on the right, and Louisa Steeley in the middle. United States Census, 1850, 1860.